On the Teleportaloo: Eagles may soar but weasels don't get sucked into jets. 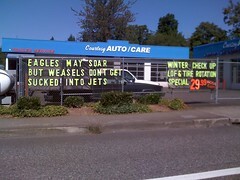 Eagles may soar but weasels don't get sucked into jets. The sign is in Portland, Oregon. (On the Beaverton-Hillsdale Highway, between Portland and Beaverton). I have no affiliation - I just drive or ride the bus past the sign most days. The sign is located here (via mapquest).